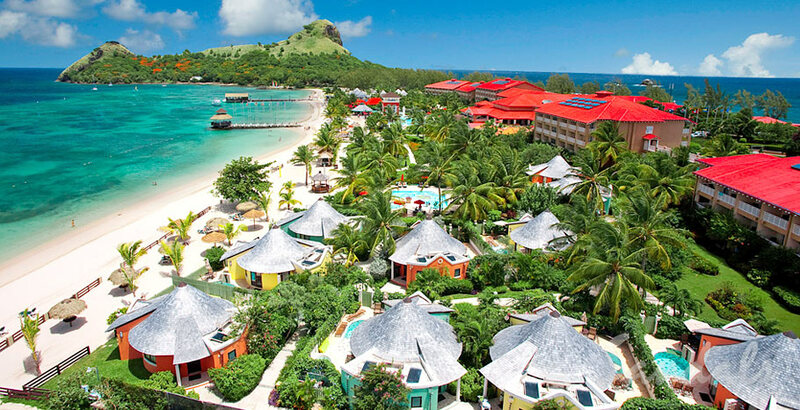 The only all-inclusive St. Lucia resort cradled on both sides by the Caribbean Sea, Sandals Grande St. Lucian’s sheltered mile-long beachfront is home to the calmest waters in all of St. Lucia. Loyal guests often describe this Sandals gem as the “closest vacation to a picture postcard” with its awe-inspiring panoramic views of historic Ft. Rodney and volcanic mountains rising from azure waters. The grande three-story lobby is reminiscent of a British palace and the gathering place for cocktails and tantalizing afternoon buffets accompanied by the soothing sounds of a grande pianist. Everything aquatic is at your beck and call during your St. Lucia all-inclusive vacation, with an alluring dive reef just five minutes away. Five fresh water pools beckon rejuvenate in the Sandals signature energy pool with swim-up bar, immerse in romance in the beachside heart-shaped pool for lovers, or glide from your living room into the exotic lagoon pool. Give in to total indulgence in the one-of-a-kind Presidential Suite or a Grande Rondoval suite-in-the-round with your own private pool. Dine around the world in eight international restaurants including the renowned over-the-water Gordon’s. Twelve additional restaurants await your pleasure at the two other Sandals resorts in St. Lucia. Excitement and entertainment abound with enthralling fire dancers, on-premise village festivals, saxophone serenades from atop the pool tower, and ongoing entertainment nightly. Learn more about Sandals Grande St. Lucian.